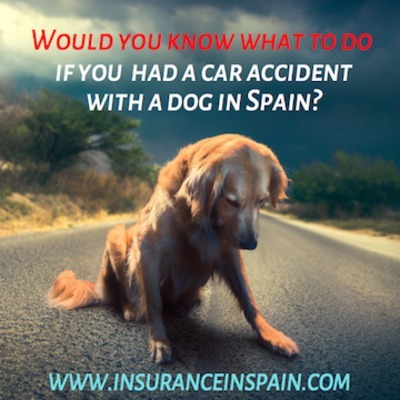 Dogs | Do you know what to do in the event of a car accident with a dog in Spain ? Would you know what to do if your car is involved in an accident with a dog? There are a large number of stray dogs in Spain and often they will wander onto or try crossing a road at some point, putting you at risk. In the event that you do have a collision with a dog, stay calm and try not to panic. Stop your car and switch on your hazard warning lights and place your emergency triangle at least 20 meters away from the rear of your vehicle to notify other traffic that an incident has occured. Put on your reflective jacket – these are required by law in Spain - your vehicle should contain at least two warning triangles and at least one reflective jacket per passenger – so you should have 5 reflective jackets in the vehicle. Assess the situation- think safety first. Approach the animal from the front so that it can see you. The animal is likely to be in pain and if it has sustained major injuries it will be frightened. Speak gently.By speaking calmly and gently to the dog will more than likely accept your approach so that you can assess the injuries to the dog. A quick examination of the dog will be extremely useful when or if you need to describe the injuries to a vet or the local police. If you do not have the telephone number of the Local vet, you may be able to find one close to you using the Internet on your phone. Alternatively, call the local police on 112. Your safety is of paramount importance – cautiously attempt to check the gums, which should be pink. The dog’s breathing, normal, laboured or heavy laboured breathing, See if there are any visible injuries and if the dog is capable of walking. Wounds and cuts need to be dealt with quickly. You should have a first aid box in your vehicle as standard. Apply pressure over the wound with your hand or a bandage or suitable cloth. If the blood seeps through the cloth or bandage, apply another one directly on top of the existing bandage, as this will continue to help with the clotting process that is being formed by the original cloth/bandage that has been applied. Do not apply a tourniquet unless you cannot stop the bleeding as this carries a risk of gangrene by stopping the circulation to the affected area. Broken bones are common in road traffic accidents involving dogs and can be recognised by the deformity of the bone, pain, swelling and unnatural movement. Do not move the dog if you suspect serious injuries – call a vet or the local police. Try and move the dog gently away from traffic without putting yourself at risk. If the dog can walk, gently help and coax it into your car. If it is essential that the dog be moved, place your hands under the chest and hindquarters. Larger dogs can be placed on a blanket or firm board and gently lifted. 1. Pull the dogs tongue forward and check there is nothing lodged in the throat. If there is an obstruction, try and remove it from the side of the mouth rather than the front. 2. Check to see if the dog is breathing by looking at its chest. Dog breathing rates can be a slow as once every 15 seconds, so be patient. 3. If the dog is unconscious, place you ear close to the dog’s mouth and listen for breathing. If it is not breathing, straighten the dog’s neck and close its mouth. Gently cup your hand around its nose and using your hand as a funnel so that your mouth is NOT in direct contact with the dog’s mouth or nose and blow gently into the dog’s nose. 4. Check for a pulse at the bottom of the chest just behind the dog’s elbow. If there is no pulse, gently apply compressions to the chest area. If the Vet has been able to attend the accident, let them do their thing. If you need to take it to the Vets for treatment, be gentle and calm and reassure the dog. It may not speak or understand your language, but it may understand the soft and gentle tone that will reassure the animal. If the dog is deceased, you will need to call the local police by calling 112 in Spain. Wait for them to arrive and keep clear of the traffic. Your safety is paramount. The local police will arrange for the local council or an appointed vet to remove the carcass and possibly locate the owner by scanning the dog for a registration chip. If you are on your own and stressed out, call a friend to come and collect you. If you are insured with www.insuranceinspain.com, give us a call on 965275727 and we will arrange for the repairs to be done to your vehicle if required. If your vehicle is too badly damaged to be removed, call the breakdown recovery number that is on a plastic card with your insurance documents and they will collect the car and make sure you get home safely.